It seems like yesterday, but it will be our Two Year Wedding Anniversary!! Wow...who would have thought it would be, but at 66 years old, the two year mark means so much to me. I've decided to submit this one to the Papertrey Ink, Make It Monday #282 Challenge - Stenciled Watercolor Backgrounds. I love this technique demonstrated by Betsy Veldman and it turned out better in 'real life'. To create this top-folding A2 card I began by die-cutting a watercolor panel and using a stencil with some Daniel Smith watercolor from one of the sample dot sheets. I used the 'genuine' colors and they were all marked transparent and I really liked them. While that dried, I used the Papertrey Ink sentiment set called Swoosh. I love that they have a tip sheet for their products. 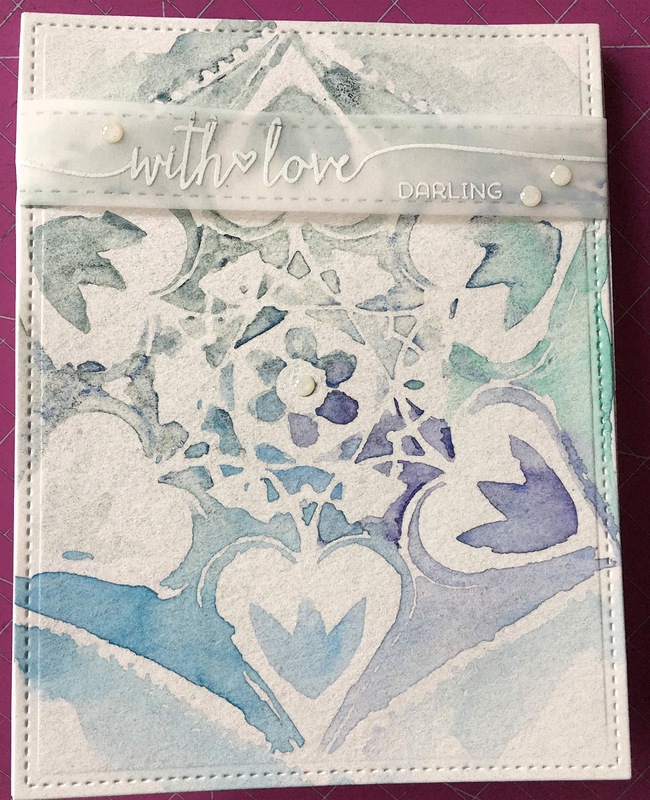 I stamped it in versamark and embossed with white detailed embossing powder, then I used a border die to cut it out and wrapped it around taping it onto the back. Lastly, I used some Doodlebug sprinkles in clear-ish to add a little something to it. This is such a pretty card! Love that design you used. 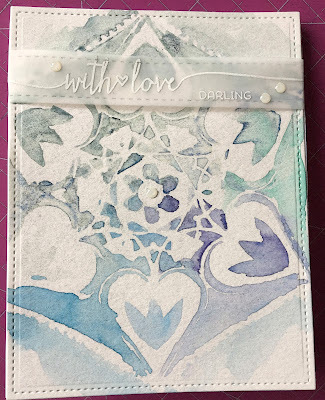 Your stenciled watercolor is gorgeous! Colors, image, and texture, lovely! Beautiful card, Mary! Gorgeous card, Mary! Love how your watercolored stencil is the focal point! this looks gorgeous Mary...love the look.